A House for Happy Mothers is available now in paperback, eBook and audio versions. You can order your copy on Amazon. Two worlds collide in the wondrous tale, A House for Happy Mothers. In a village in South India, Asha and her husband struggle to provide for their two children. Desperate to provide a better education for her gifted son, Asha reluctantly joins the Happy Mothers House, a surrogate facility where she will rent her womb for a childless couple in America. In the Silicon Valley, Priya and her husband enjoy a fulfilled life in many aspects but for the child Priya is unable to have. As each chapter unfolds, Priya and Asha discover the best and the worst that India’s rising surrogacy industry has to offer. A House for Happy Mothers is the beautiful, heartwarming, emotional journey of two women who rediscover themselves while uncovering the truth behind motherhood and surrogacy, and in turn bring hope to each other. Many, many thanks to Tanya at Mom’s Small Victories blog who has generously put together Book Club Discussion Questions. 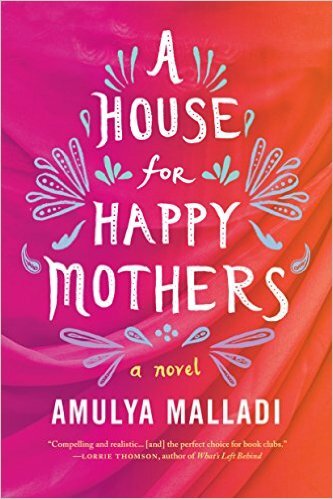 Download your free A House for Happy Mothers by Amulya Malladi Book Club Discussion Questions. Malladi writes a poignant novel from two difficult perspectives that spans several complex and often controversial topics. This title would make a great book club selection. A House for Happy Mothers is insightful, moving, and heartbreaking. Completely captivating and eye opening. A House for Happy Mothers is a sensitive exploration of the emotional terrain of motherhood and the socio-economic complexities of our global world. Amulya Malladi’s novel contains no villains or heroes, just breathing, living characters who will draw you into their heartbreak. In this timely contemporary novel, Malladi describes the important and controversial issue of surrogate pregnancy with a light and masterful touch.Readers will find their hearts deeply touched by the longings of the two women who become inextricably intertwined in this process of giving and receiving the ultimate gift–the birth of a child. A subtly nuanced and compassionate look at the controversial “rent a womb” industry, Amulya Malladi’s book is timely and illuminating. Compelling and filled with insight. Malladi’s voice is layered, and her empathetic powers highly developed. Indian surrogacy is a crucially important and little-considered subject, and Malladi’s novel is thoughtful, enlightening, and moving. How far would you go to have a family, and how far would you go to save the family you already have? In A House for Happy Mothers, Amulya Malladi skillfully and compassionately raises these questions in a thought-provoking, modern-day family saga set amidst the backdrop of traditional Indian and American maternal expectations. A House for Happy Mothers shines an unblinking light on the business of surrogacy in India, and the emotional fallout. Can anything balance the inequality of power between a poor surrogate and a biological mother? A husband and wife in an arranged marriage? A mother and daughter struggling with years of perceived disappointment? Compelling and realistic, Amulya Malladi’s latest release is the perfect choice for book clubs, and any reader with a questioning mind and an open heart.